Stir the salt, brown sugar, peppercorn, bay leaves, thyme, sage, and garlic together in a large stock pot. Add 13 cups of water and 3 cups of apple cider. Bring to a boil, remove from heat, and allow the mixture to steep for 25 minutes. Stir in enough ice to bring the brine amount up to 2 gallons (2 gallons = 32 cups). If your pot is not large enough, you may have to allow the brine to cool and add the additional amount when pouring the brine into the bag in the following step. Place the turkey in a large zip-top bag. I recommend the Ziploc Big Bags (size large). Put the bagged turkey in a clean cooler. Pour the brine over the turkey, in the bag, making sure the breasts are fully submerged. Zip the bag closed. Place the cooler in a cool place, such as your garage, and allow the turkey to soak in the cold brine for 12-24 hours. Use gel packs or bagged ice around the zipped bag inside the cooler, if necessary, to keep the brine below 40°F. (Adding more ice directly to the brine would only dilute it.) After the brining process, transfer the turkey to a roasting pan, pat dry, discard the brine and prepare for roasting as you usually do. You will not need to salt the bird when preparing it for roasting. Stuff with herbs, quartered onion, carrot, celery, and rub with butter. For a smaller turkey you may make less brine; however, be careful to do so with the original proportions of ingredient still intact. Too much salt will leave you with an incredibly salty turkey. To estimate your brining time plan 45-60 minutes per pound of the turkey. Brining should only be used on turkeys that have not previously been soaked in a salt water solution. 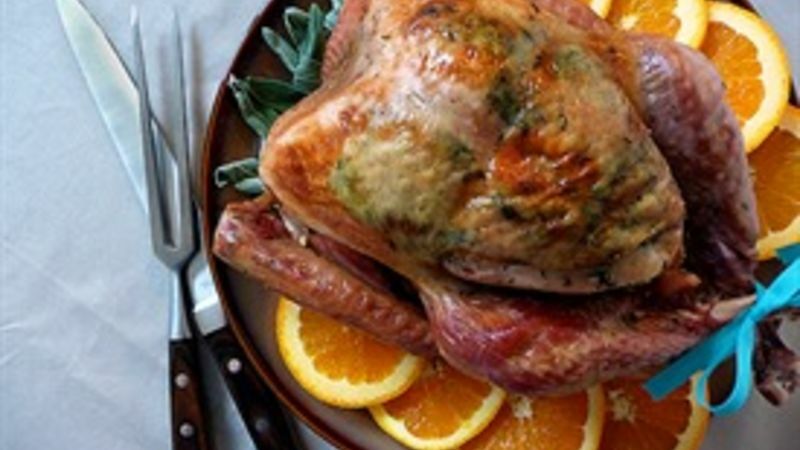 Fresh, unfrozen turkeys are prime candidates for brining. If you plan to use a previously frozen turkey, check the label first to see if it was soaked in a salt water solution. If unsure, call the phone number listed on your turkey’s packaging to speak to a company representative.